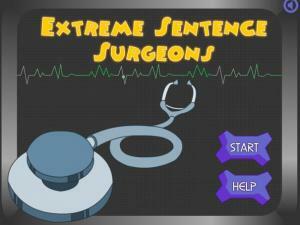 In this game you will learn to put words in the correct order to make a sentence. Remember that a capital letter goes at the beginning of a sentence and a period (or full-stop) goes at the end. 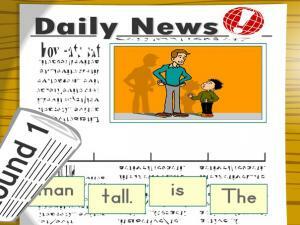 Look at the picture in the Daily News and listen to the sentence spoken. 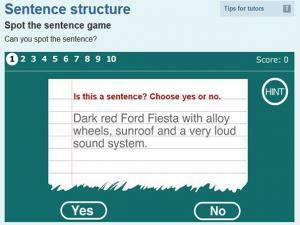 Move the words into the right order on the page to form the correct sentence. Can you build your clubhouse? Test your understanding of the different types of sentences (statements, questions, exclamations and commands) by identifying the type of sentence and then correcting the text for punctuation and spelling errors. 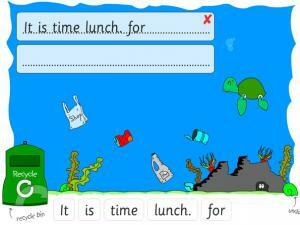 Help Wellington clean up the sea by re-arranging the words of a sentence into the correct order. For each correct answer you can clean a piece of rubbish into the bin! 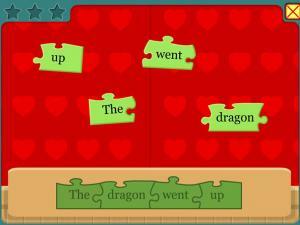 Click on the words and move them to the correct place in the jigsaw to complete the sentence. Check you have the right order for it to make sense! 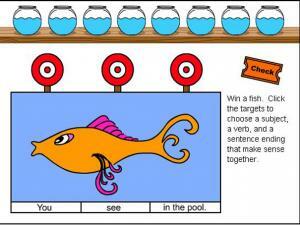 This is a nice, simple game to help students begin learning how to form short sentences. Click and drag the puzzle pieces to make a sentence. Get it right and hear the full sentence spoken and watch what the dragon does! 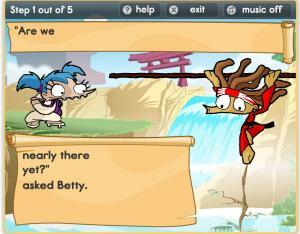 Look at the 3 pictures and the words. Click on the pictures to put them in the correct order to make a sentence. 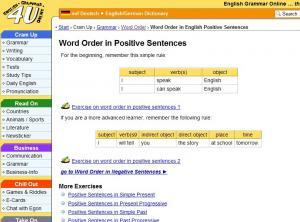 Watch this video grammar lesson to learn about word order in English, including subjects, verbs, objects and phrases in both statements and questions. 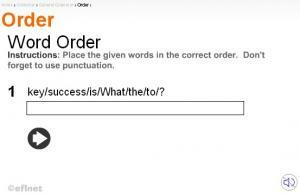 It is an exercise on word order. Subject + verb + object. 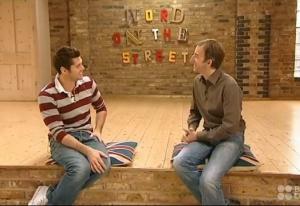 Is the word order in English difficult to understand? 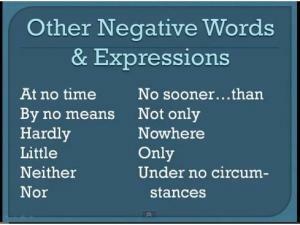 Word order is an essential part of English. 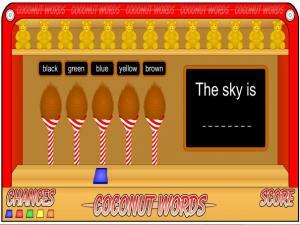 This lesson shows you the correct word order and has exercises to put the words of a sentence in the correct order. 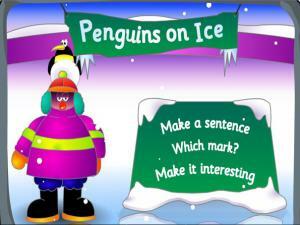 Learn all about making sentences with the factsheets and then complete the worksheets for extra practice. There's a challenging set of games for practice, too! When you've finished, take the self-test and check your answers to see how much you learned about making simple sentences. 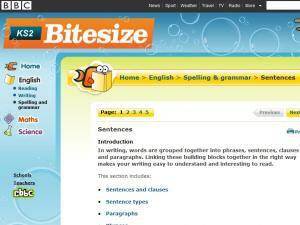 Includes facts about general word order and punctuation rules. 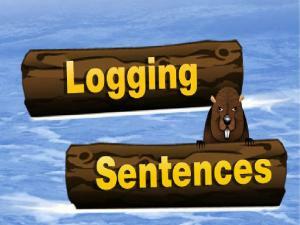 Guide Bryan the beaver to the other side of the river by jumping on the right logs to complete the sentence correctly. 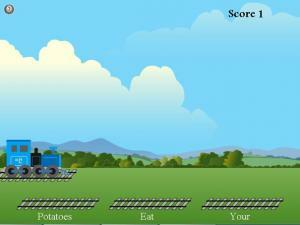 Use the arrow key on your keyboard to jump. You can use the turtles to wait on for the next right log. Choose Easy or Hard to start. Remember, timing is important. Try not to get Bryan wet! 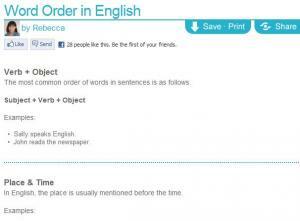 Review the most common word order in English, including situations involving adverbs and time. What are the differences between these three? 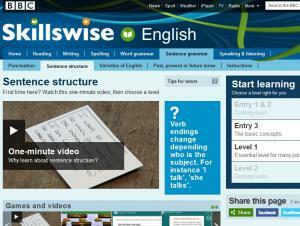 If you don't know, check out this page to learn how to construct English clauses, phrases and sentences. 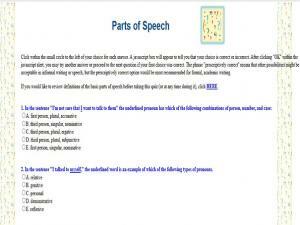 In writing, words are grouped together into phrases, sentences, clauses and paragraphs. 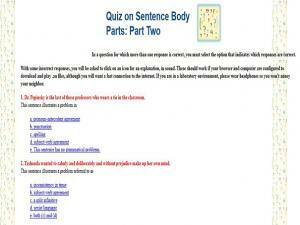 This page explains the parts of a sentence, including clauses and phrases, as well as sentence types. 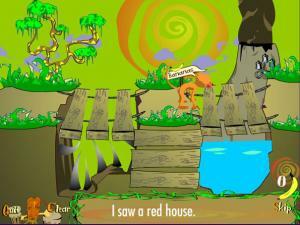 After reading, play the fun "haunted house" game to test your knowledge or take a self-test! You're Trapped! 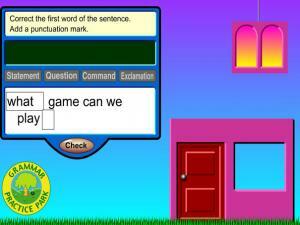 Escape from the tower in these games of simple, compound and complex sentences. Rebuild the "Wall of Sorrow" by using the bricks with properly punctuated sentences. 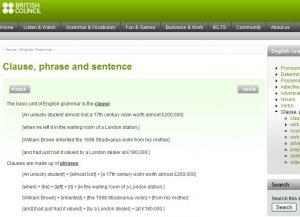 Learn the difference between simple, complex and compound sentences. 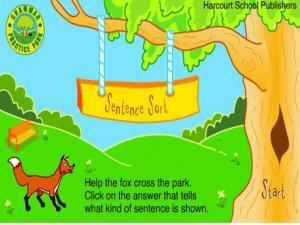 Help the fox cross the park by clicking on the correct answer that tells you what kind of sentence is shown. 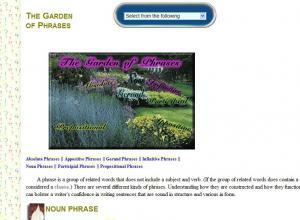 A phrase is a group of related words that does not include a subject and verb. There are several different kinds of phrases. Understanding how they are constructed and how they function within a sentence can bolster a writer's confidence in writing sentences that are sound in structure and various in form. Use this detailed guide to learn about different types of phrases, then take the quiz to check your understanding. 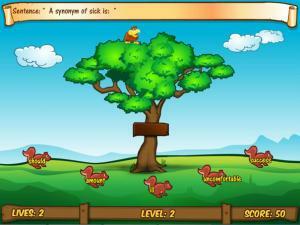 Read the sentences and then click on the correct animal with the word that completes the text or answers the question. 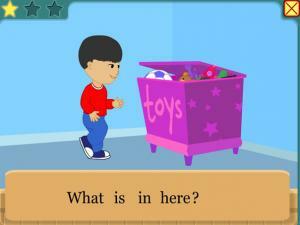 The questions get harder as you progress through the levels. You need to get all 5 right before you run out of lives! The subject of a sentence is the person, place, thing, or idea that is doing or being something. 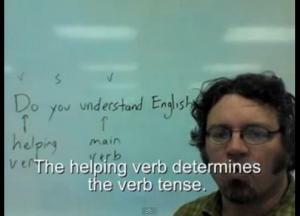 You can find the subject of a sentence if you can find the verb. Finding the subject is essential part of constructing basic English phrases. 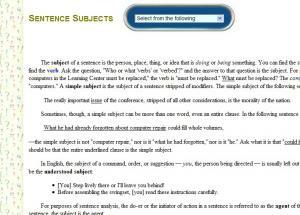 This site offers detailed information and examples about sentence subjects. Test your understanding of sentence structure by reading the sentences and answering "yes" or "no" depending on whether they are grammatically correct or not. A predicate is the completer of a sentence. 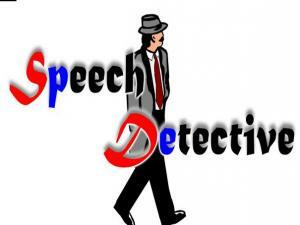 The subject names the "do-er" or "be-er" of the sentence; the predicate does the rest of the work. 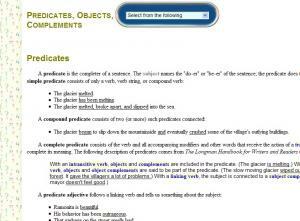 To learn more about the types of predicates, objects and complements you can visit this site, especially appropriate for learners interested in writing in English. 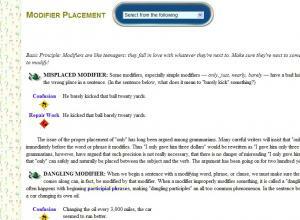 Click on the sentence fragment with your mouse. 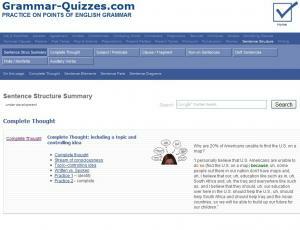 At the bottom of the page, click on next quiz for more practice. 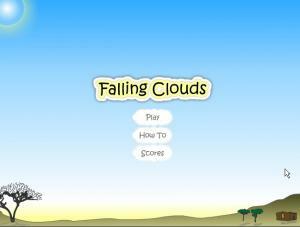 Test your writing skills by correcting the paragraphs in this fun game. You need to check spelling, punctuation and word order. You will see the number of errors in each text on the Illness Chart clipboard. Click on the word that needs to be corrected and then edit it in the box below. Good luck! 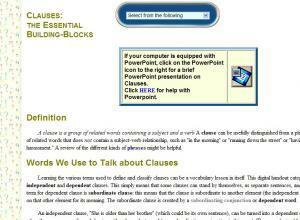 A clause is a group of related words containing a subject and a verb. This helpful review of clause types is directed toward intermediate and advanced learners who are focused on writing in English. 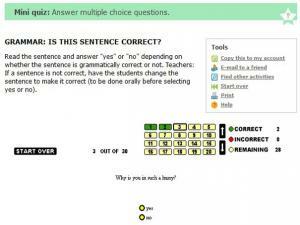 This is a self-checking quiz where you have to read each run-on sentence and select the remedy that would best repair that sentence. After you have checked your answer you can get a full explanation as to why you got it right or wrong! 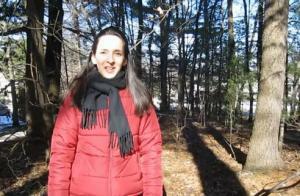 This site offers detailed explanations about academic, proper English modifier placement; it does not reflect how English is spoken in daily life. 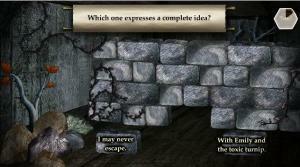 Can you escape the tower by rearranging the words in the correct order to make a sentence? 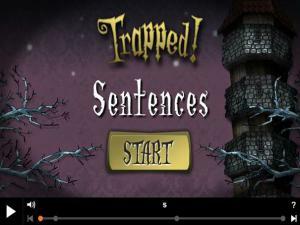 You will be tested on simple sentences at first but then it gets harder and you will have to sort out complex and compound sentences as well to escape!